Visiting the capital of Chile felt like we were back in any modern day big city in America. The city has numerous districts, each with their own distinct feel. Steve and I were surprised that the effects of government issues from generations ago still haunts the citizens today. We took a tour with a college student and were fascinated with the challenges that plague Chile and the steps young people are taking to make improvements. We left Arica on a midnight flight using the budget airline, SkyAirline. We bought the lowest class ticket for $45 each, and were delighted that it included free carry-on bags. A lot of South American budget carriers – you basically pay for every add on, including printing a ticket. Once entering the plane, we figured out why it was so cheap – there were more advertisements on the plane than the New York Subway! Even our seatbelts had an advertisement. The seats were a little tight, but luckily the row behind us was empty and I was able to spread out in that row. Overall, SkyAirline was fine for the purpose it served, although I probably wouldn’t want to take a long flight on there. Once arriving in Santiago at 2:30AM, we got an Uber. Steve recently bought a Virgin Mobile chip for his phone, which took the stress off of finding an WiFi signal to get us an Uber. Per the Uber app, we waited for Uber across the terminal at the Holiday Inn hotel. Our Uber ride had to park in a nearby lot. We arrived at our apartment by 3:30AM. In Santiago, they have a fantastic metro system. We were able to use the Metro easily. We were able to buy one-way tickets that got us into downtown. We debated about buying a Metro card, but in the end we decided it was cheaper for us to get the paper one-way tickets. We stayed at an AirBnB apartment near the Ñuble metro station. The location was perfect. The metro was a 5-minute walk, the ride into downtown was 8-10 minutes. Nearby we had a market, and a Chilean Walmart! The apartment was comfortable, and cute. Our first task here in Santiago was to go some prep work for our upcoming camping trip. Our shopping list included bed sheets, blankets, pillows, groceries, flashlights, shampoo, conditioner and more. We found the Chile Walmart – Lider! We are on a budget, so we were pretty stoked to find this store. We were surprised to see that the prices in Chile are similar to prices in America, Chile is by far the most expensive country we have visited in South America. We bought some “Great Value” branded everything, but decided to splurge on Pantene shampoo – oh luxuries! The store was clean, and organized. It is Christmas time right now, so of course, it was a bit of a hot mess, but we made it through most of our shopping list. We decided to take a free walking tour with the company “Spicy Chile”. Our tour guide, Maitane was awesome! Originally from the Basque region, she moved to Chile 3 years ago and is loving life there. What made the tour excellent was Maitane’s stories. She gave us a lot of history about Santiago, including political, along with modern problems. Some current problems facing Chile today include: the rise of obesity (fast food is cheaper than cooking at home… sound familiar? ), the government’s poor treatment of its indigenous people which makes up 9% of its population (wow… sound familiar? ), and the rise of big businesses ruling politics, making it a very private sector run government (really….!??!?!). Throughout the tour we saw such fantastic sites! Santiago is really a beautiful city! 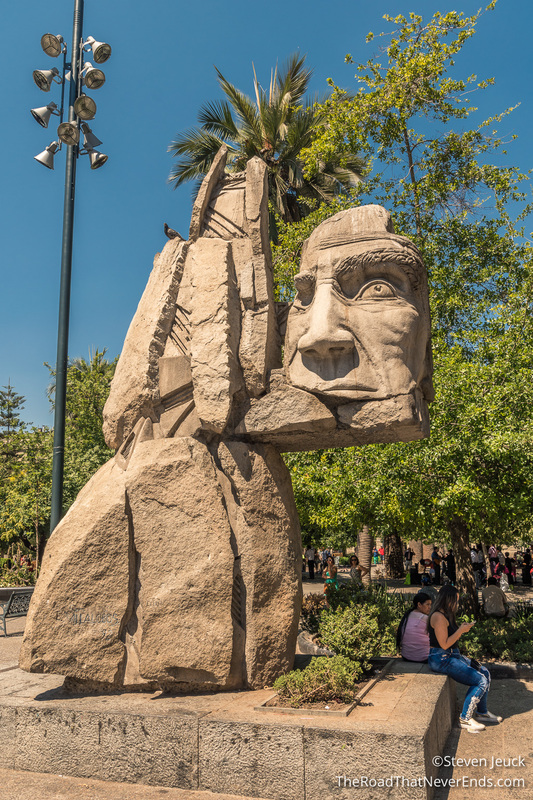 Plaza de Armas – originally built in 1541, and recently remodeled in 2014. The square has art, crafts, and beautiful architecture. 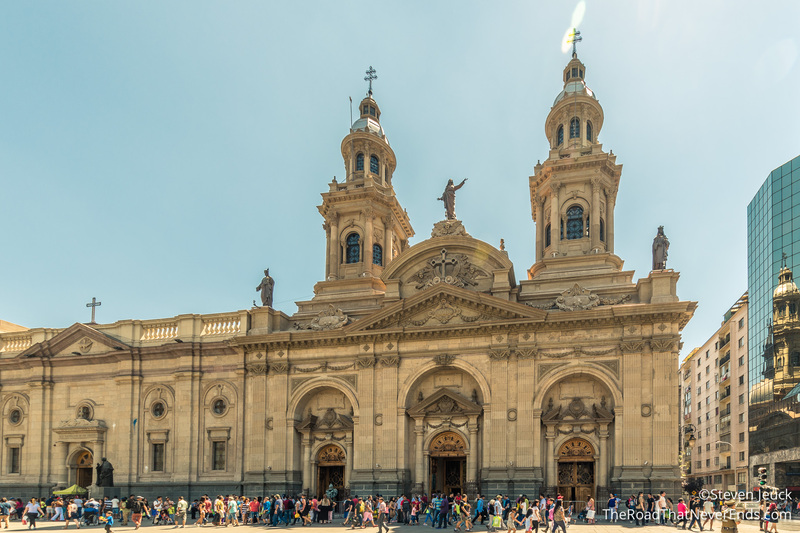 Catedral Metropolitana de Santiago – Built in 1800, we didn’t get a chance to go in, but admired the beautiful church from outside. 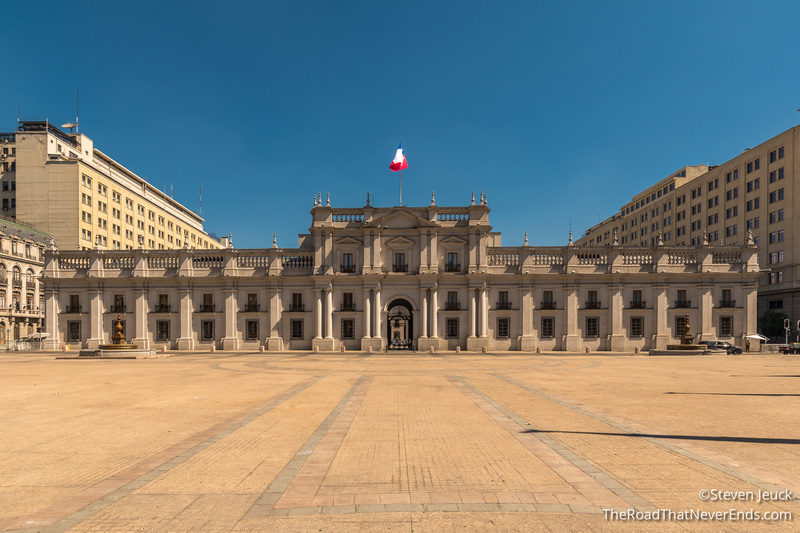 Palacio de La Moneda – Where the President of Chile works (not lives). Remember, this place was bombed in 1973 and went a reconstruction shortly after. 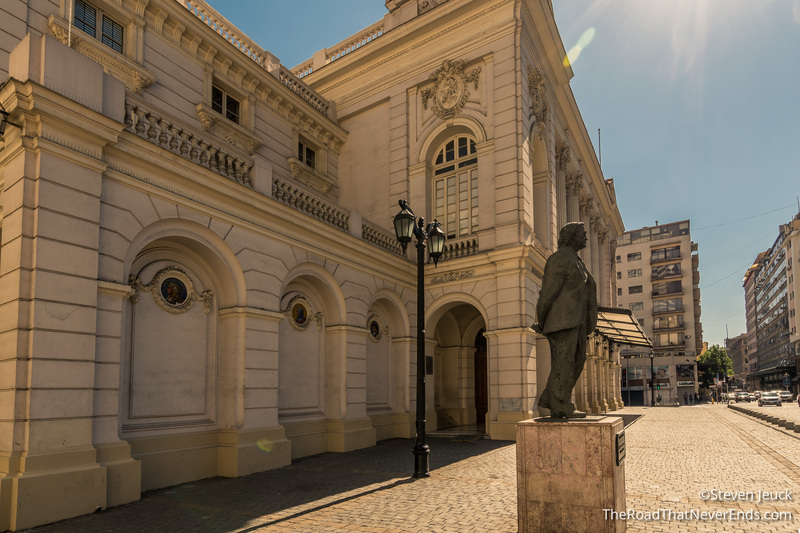 Opera House – Opened in 1857, still operates as a theater today. 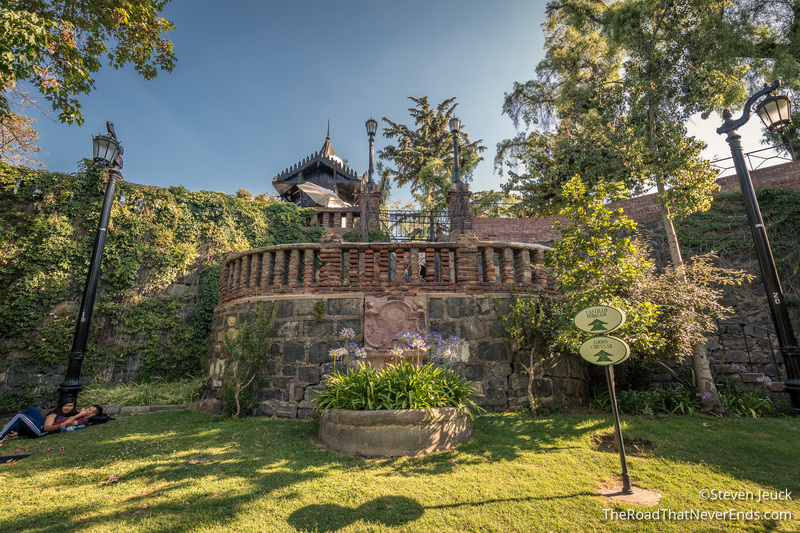 San Lucia Hill & Castles – This hill was once a volcano, and now it is a park, built with castles, viewing points and trees. 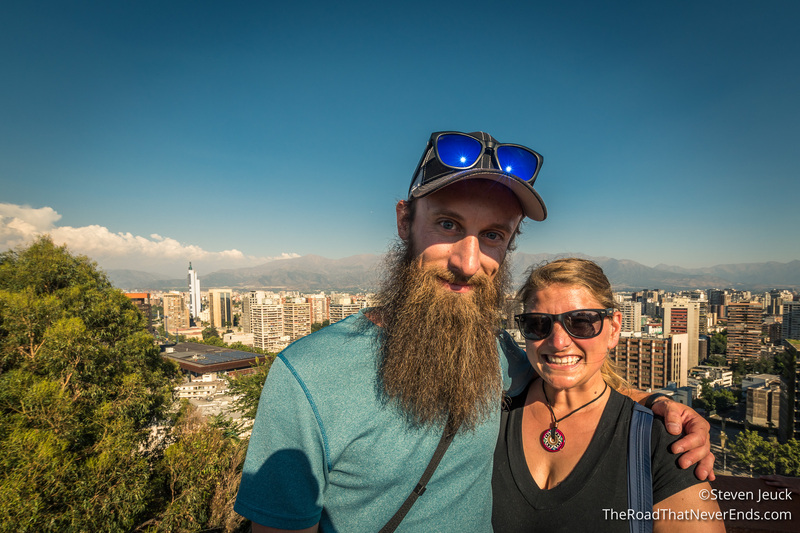 We loved taking the climb up there and checking out the Santiago views. We hit the road in our WickedCamper heading South! Stayed tuned!